Mathieu Kassovitz' gritty 1995 French drama is planned for Blu-ray this spring. In an early announcement to retailers, the Criterion Collection says 'La Haine' is coming to Blu-ray on May 8. The Blu-ray will feature a 1080p transfer, DTS-HD Master Audio 5.1 soundtrack, and supplements include: English-language audio commentary by Kassovitz; Introduction by actor Jodie Foster; Ten Years of “La haine,” an eighty-minute documentary that brings together cast and crew a decade after the film’s landmark release; Featurette on the film’s banlieue setting, including interviews with sociologists Sophie Body-Gendrot, Jeffrey Fagan, and William Kornblum; Production footage; Deleted and extended scenes, each featuring an afterword by Kassovitz; Gallery of behind-the-scenes photos; Trailers; and a new essay by film scholar Ginette Vincendeau and an appreciation by acclaimed filmmaker Costa-Gavras. 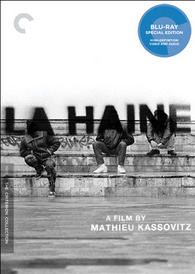 You can find the latest specs for 'La Haine' linked from our Blu-ray Release Schedule, where it's indexed under May 8.